The Funtime Brigade was ignited into existence when two singer songwriters who share a passion for music, Peter Adams and Jesse Potter, reunited. They also share a long time friend, Oliver Lund, with whom both had worked with on projects in the past, and before he knew it, Oliver was in the band. Then, to the band’s delight, a Wolfville music hero, Jamie Loughead, joined the band as bass player, and the songs that Jesse and Pete were concocting began to come to life. 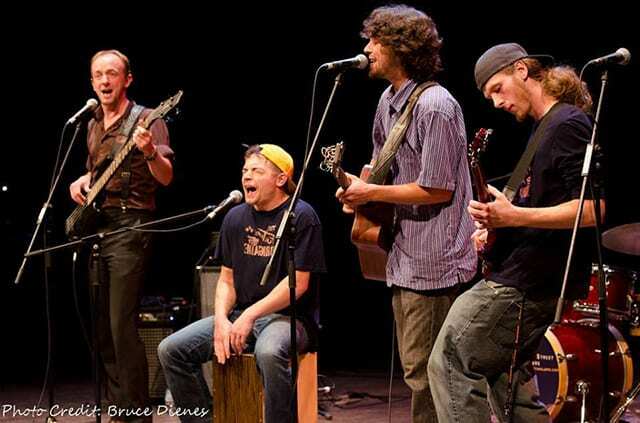 The Funtime Brigade’s music features a blend of rap and folk styles, with a touch of funk and Indian guitar scales. Their songs are well articulated, and almost every line is written in co-operation. The band loves to jam, gig and improvise. They are all about having a fun time and we have no doubt that Deep Root audiences will love sharing in all that fun time energy.